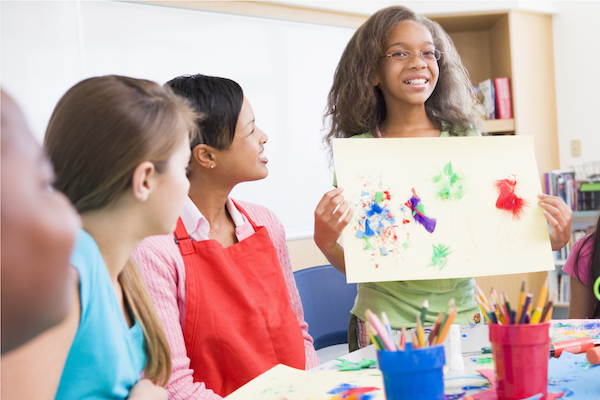 Even if you don’t consider yourself as an artistic or creative “type,” you can enrich your students’ learning experiences by incorporating the arts into your classroom activities. Dr. Mariale Hardiman, professor at Johns Hopkins School of Education, proposes that there are positive “Memory Effects” that teachers leverage for their students when they use artistic activities as part of instruction. She argues that adding the arts into a general curriculum increases student attention and motivation. Other studies show that it may also be effective in improving long-term retention of information. A great way to launch a new topic of study is to share an interesting work of art to your class as a jumping-off point. Using arts-related experiences as entry points to deeper learning is a goal of Project Zero at Harvard’s Graduate School of Education. You can display an image of a painting or photograph, play a piece of music, or show a movie clip of a dance or theatrical production. This offers students with no prior knowledge of the subject a helpful starting point in constructing understanding, and provides a new context to introduce new vocabulary. Another great resource for starting with art is Artful Thinking, which “help teachers regularly use works of visual art and music in their curriculum in ways that strengthen student thinking and learning.” Artful Thinking routines are simple yet powerful methods to foster high-level thinking in regular classrooms. For example, a teacher can have students engage in the “See/Think/Wonder” routine with a work of art. First, students are asked to identify what they see, noticing details, then they are asked to think about what they see, prompting a shift to analysis. Next, they share what it makes them wonder, setting the stage for inquiry. These thinking routines provide opportunities to develop metacognitive and critical thinking skills through engaging with learning content. During a unit of study, encourage students to explore and represent ideas using artistic means. One time-honored method is using a sketchbook to record thoughts. Leonardo DaVinci is famous for his notebooks filled with detailed drawings and notes of ideas, experiments, inventions, and curiosities. Another notable documentarian, Maria Merian, carefully observed insects in the 17th century and revealed new ways of understanding botany and zoology through her drawings. These are excellent examples of the power of journals to document learning and make thinking visible to others. Sketch-noting is also making its way into more and more classrooms. In this approach to visual note-taking, ideas are represented using a mix of drawings, handwriting, shapes, color, and visual elements such as arrows and lines. Teachers and students are creating sketch-notes in various ways including chart paper, sketchpads, and on mobile devices using styluses and creative apps. What is especially helpful about this approach is value placed on the process of learning and connections between ideas, instead of focusing only on a polished final product. Given the opportunity to create their own artistic works to demonstrate their learning, many times students will come away with an idea that is new and exciting to them. Likewise, when students have an enthusiastic audience for their creations, that love of learning is spread throughout the community. Still stumped about how to support arts in your curriculum? Seek out art, music, and theater teachers and ask if they can share resources. A media specialist can be an excellent person for suggestions, too. Reach out to parents or school alumni with various areas of artistic expertise to help support your efforts to infuse the arts. Even if it’s not your forte, these teachers will likely be more than happy to share their resources with like-minded instructors!